Designed and tournament tested by professional fishermen that demand high quality and consistency that give them the edge to boat more fish. Phenix blades are made with the highest quality components such as Gamakatsu Hooks and Sampo Swivels. Special, painted blade finishes are available on some models. 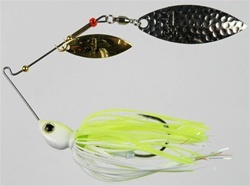 Designed by West Coast Angler Tim Klinger.